How is dark matter defined? It is matter that does not emit light and therefore is not visible to us. In many theories, dark matter plays an important role for the evolution of the Universe. The most evident indication for dark matter comes from rotational curves for different spiral galaxies. 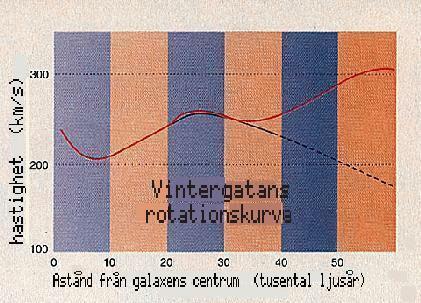 The rotational curves are obtained by measuring the rotational speed for stars as a function of the distance from the centre. In order for a star to stay in its orbit the speed of the star and the mass of the galaxy inside the orbit must follow a certain relation. Otherwise the star will either be released from the galaxy or fall into its centre. In other words, the force that keeps the star in its orbit is the gravitational force from all the matter inside the orbit. The figure shows the rotational curve (dashed black) that one expects from the visible matter in the Milky Way compared to what has been measured (red). The difference can only be explained by additional matter in the galaxy. What does this additional matter consist of? Today we do not know the answer to this question, but there are different theories. The two most popular models are that it consists either of MACHOs (MAssive Compact Halo Objects) or WIMPs (Weakly Interacting Massive Particles). One has looked for MACHOs in many different experiments. The results from these experiments suggest that probably MACHOs exist, but their total mass is not enough to explain the rotational curves. The idea behind the experiments is that the MACHOSs can be used as gravitational lenses for light from stars behind them. Another indication for dark matter is from studies of clusters of galaxies. The galaxies in the clusters must be kept together by the gravitational force. However, the amount of visible matter is much smaller than what is needed to keep the clusters together. The mass that is needed for this is so large that it would constitute about 50 % of the critical mass. Many of the theories for dark matter are based on the existence of particles created in the Big Bang. These particles have not interacted with other particles in the way that quarks and nucleons have formed composite particles, but instead they have remained as a remnant from the early Universe. Some of these particles could be massive neutrinos, or other particles that have not yet been observed but are predicted by different theories, for example neutralinos (WIMPs). One group from Uppsala is looking for these particles in the AMANDA experiment located at the south pole.